Trail-running in Morocco has grown exponentially over the last few years. With some important races — like Morocco Race, Nomads Run and Marathon des Sables — attracting runners from all over the world, the country has become a sort of global hotspot for this activity. Morocco offers trail runners a unique mix of mountain environment, local culture and great weather. “The Berber culture, the food, the hospitality, the scenery, the sun…and it’s just a few hours’ flight from Europe”, says Marc, a British UIMLA-certified mountain leader featured on Explore-Share.com and based just outside Marrakech. Unlike the trails in the Alps, however, trails here are not marked and running with a local guide is of crucial importance. Both to avoid getting lost and to find the best trails, a guide can make a big difference to your day! From half-day programs to 2- or 3-day running holidays, Morocco has something for everyone. Whether it’s your first time trail-running or you’re training for an ultra-marathon, you’ll find an activity that suits your expectations. Looking for some inspiration? This is our guide to the best three spots to go trail-running in Morocco. Just 40 kilometers outside Marrakech, this area is perfect for those who want to fit some running into their vacations. Referred to as a “desert”, it is far from the image most of us have of the Sahara. It is a deserted plateau dotted with small Berber villages. You’ll find it hard to believe you’re just a half-hour away from the hustle of Marrakech! Running in the Agafay desert is a great way to get a taste of the local culture. It is also a good idea if you want to peek into real Moroccan villages. Because of its low altitude, it is also an ideal place for beginner trail-runners. You’ll enjoy incredible views of the Atlas’ mountains and, during the spring, the wild flowers that cover the area. The Agafay Full Moon Run takes place here. Timed to coincide with the full moon, it is held during the holy month of Ramadan. This 12-km run is suitable for runners of all levels. You can expect a true celebration! You’ll be running to the rhythm of Berber drums and share a meal at the end. You can even choose to spend the night under the stars! Nomads Run is another event held at the Agafay Desert. It is probably the most popular with families, as children are also invited to participate and cover some sections of the race. You can choose between running and biking and it is also open to athletes of all levels, with distances ranging from 12 to 60 kilometers. Marc and a group of Swiss clients, who contacted him via Explore-Share.com. Photo: Marc Gallagher. Located at 1800 meters above sea level, this small village is the gateway to nearby Mount Toubkal (4167m). Toubkal is the highest peak in northern Africa. Given the altitude, you’ll need a very good fitness level to run in this area. Several running trails pass through the small villages of the Imlil Valley and will also allow you to get a glimpse of local village life in Morocco. Running to the Mt. Toubkal summit is also possible in the company of a local guide, although reserved for extremely fit runners. To give you an idea of just how challenging the ascent is, think about running a half-marathon up a mountain (and add the altitude to the combo!). Also reserved for those with an excellent fitness level and preparation is the Trans Atlas Marathon. It is organized by famous Moroccan runner Mohamad Ahansal. This 280-km race takes runners across the stunning Atlas Mountains, from Zawiyyat Ahansal to Imlil, in 6 days. For the rest of us mortals, there are also 12 and 20-km per day options. Unbelievable views from Oukaimeden, another great trail-running spot in Morocco. Photo: Tadd and Debbien Ottman. Located 80 kilometers outside Marrakech, the ski area (2600m) is also a popular trail-running spot in Morocco and a great place to take full advantage of everything the High Atlas have to offer: ski touring, hiking and fishing, among the many options. Oukaimeden is also a fantastic area for rock climbing. There are lots of great trails from Oukaimeden, with varied levels of difficulty and the stunning scenery as a bonus. High altitude running in this area is best during the spring, summer and autumn months. During the winter, the ground in covered in snow. Oukaimeden is, in fact, the starting point of the UTAT Ultra-Marathon, which takes place in October. This is a high altitude race and you need to prepare well! However, three distances are available — 26km, 43km or 105km — so you can pick the challenge that best adapts to your fitness level. Hiring a local guide to do some practice runs a few days ahead might be a good idea to prepare for the race. And then there’s a fourth area that also deserves a mention: the Anoughal Valley, just outside Marrakesh. Because of the short distance, it is an ideal place to go for a half or full-day run while on holidays or business in the city. Tourism-wise, it is completely underdeveloped and therefore a great place to get off-the-beaten-path and into the more traditional Morocco. Marc offers a nice 15-km run in this area that has become a favorite among his clients. Morocco Race, a 3-day trail-running event will take place in this area next November. Christophe Thomas runs side-by-side with Laurence Klein, winner of the 2010, 2011 and 2012 editions of the Marathon des Sables. Photo courtesy: Christophe Thomas. But an article about trail-running in Morocco wouldn’t be complete without mentioning the famous Marathon des Sables, a “grueling” multi-stage race that has been taking place in the Sahara Desert, in Morocco, since 1986. It is probably the most extreme ultra-marathon in the world and the Discovery Channel has rated it the “toughest footrace on Earth”. This 6-day event covers 254 kilometers. On the fourth and longest day, participants run over 86 kilometers! And if you take into account that temperatures rise over 50⁰C and that you’ll have to carry your own food and water, you’ll understand why this race is not to be taken lightly. In fact, people train for the Marathon des Sables for years! For many of them, it is a life-changing experience. “This race had transformed me. It had made me into a different father, a different son, a different man. And from this was born the desire to share this incredible ordeal and atmosphere with other runners”. After his first experience, Christophe returned in 2014 as part of a team of 15 runners. So if you now can’t wait to test your running under the Moroccan sun, please take into account the best months to visit the country. Although trail-running can be practiced in Morocco year-round, the summer can be a little too hot (with temperatures rising over 35⁰C even in the mountains). During the winter, there is snow above 1500 meters, so it’s just a matter of staying below the snow line. “You’ve got the wild flowers, the green grass, the snow at the top of the mountains and the great weather”. An unbeatable combo! The arid climate of the Moroccan mountains is one of the factors that makes it such an attractive trail-running destination. It almost never rains. And although Marc can’t guarantee perfect weather, he says it is “fairly likely” that you’ll be running under a clear blue sky. While many visitors take one or a few days out of their vacations in Morocco to do some running, as the country becomes more popular among trail-runners, some are choosing to visit the country exclusively to run. Marc’s programs are targeted both to beginner trail runners and to more experienced ones, some of whom are preparing for the local races. Cost is also a factor that has made Morocco the up-and-coming destination for trail-running: “I usually tell my British clients that hopping on a flight and coming to Morocco is probably cheaper that going to Scotland,” says Marc. Agafay desert, Oukaimeden and Imlil/Mount Toubkal. 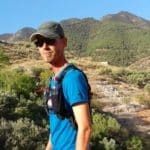 Three amazing spots for trail-running in Morocco!